Custom Cut Fabrication uses state of the art laser cutting technology for the most detailed, intricate cuts imaginable. You can bring your own custom designs to us or we can work with you to achieve the perfect design. Our laser is capable of cutting tight words and letters, large shapes and objects, flat surfaces, round surfaces, pipes, sheets, and everything in between. Check out some of our latest custom laser projects here. Looking for laser cuts for a large job? We do that too. While laser cutters work great for those intricately designed projects, it’s also a great option for large quantity rush jobs or for mass producing the same cuts over and over again. 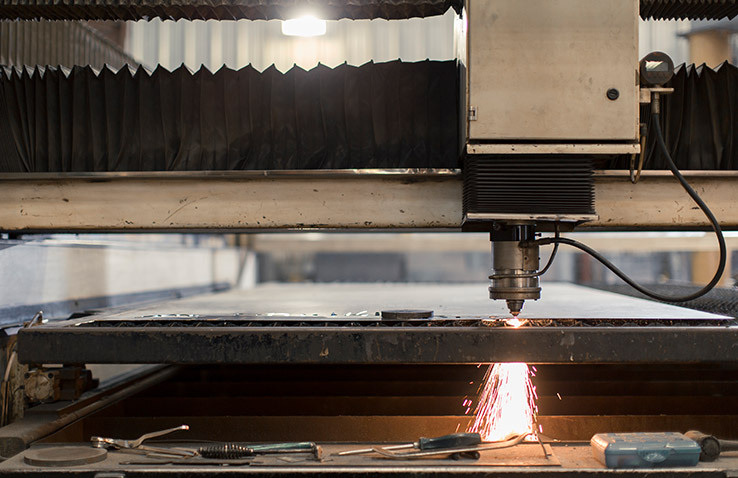 Our laser table can cut metal sheets up to 7′ by 14′ in size. Not sure of what types of cuts are best for your project? Not to worry. You can talk to one of our sales associates about a quote on your project and we’ll collect your requirements. Then, we’ll give you a quote based on the quickest and most cost-effective method. Request a quote today. © 2017 Custom Cut Fabrication.